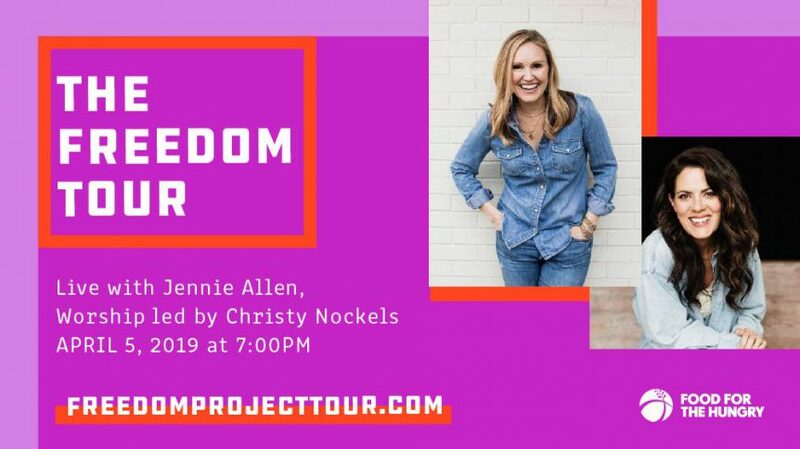 Join us for the 2019 Freedom Tour with Jennie Allen & Christy Nockels! Worship with singer/songwriter Christy Nockels, and learn from Bible teacher and the founder of IF:Gathering, Jennie Allen. We’ve been given freedom in Jesus, now let’s learn what it means to live like it! Bring friends or come alone, you’re welcome just as you are! You will also hear from our friends at Food for the Hungry. Food for the Hungry seeks to end ALL forms of human poverty by going to the hard places and walking with the world’s most vulnerable people. Get your tickets online or at Connection Coffee & Books! Group Rate: $15/ticket for 10+, only available through March 5th.